Prague, the capital of the Czech Republic, can boast by several complimentary nicknames such as: „Praga mater urbium“ (Prague – Mother of Cities), the “Golden city“ or the "City of Hundred Spires“ - based on a calculation of the Czech mathematician, philosopher and Catholic priest Bernard Bolzano (1781-1848). Bolzano counted that Prague has 103 towers at the beginning of the 19th century. Currently, the estimated total number of towers is 500. 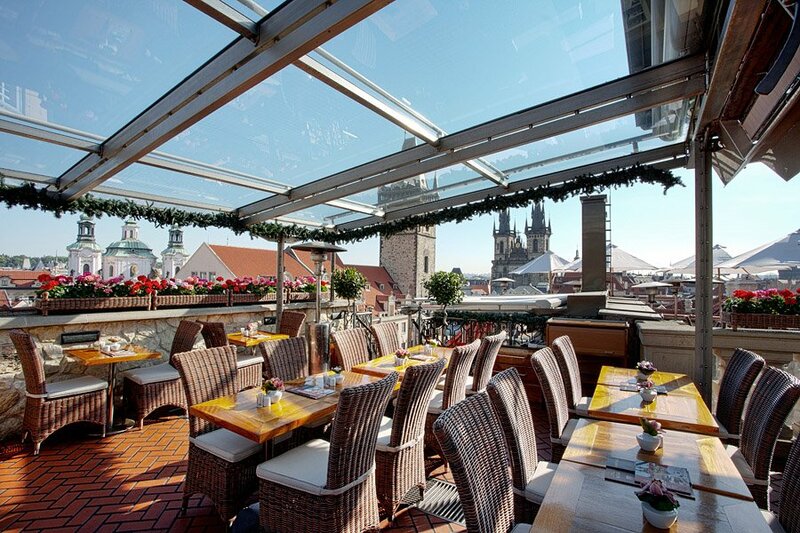 For unbelievers, here is the list of the Best Rooftop Restaurants where, during the delicious lunch or dinner, you will have the opportunity to enjoy a magnificent view of the Golden city and scrutinize whether the number of spires were counted correctly :-). 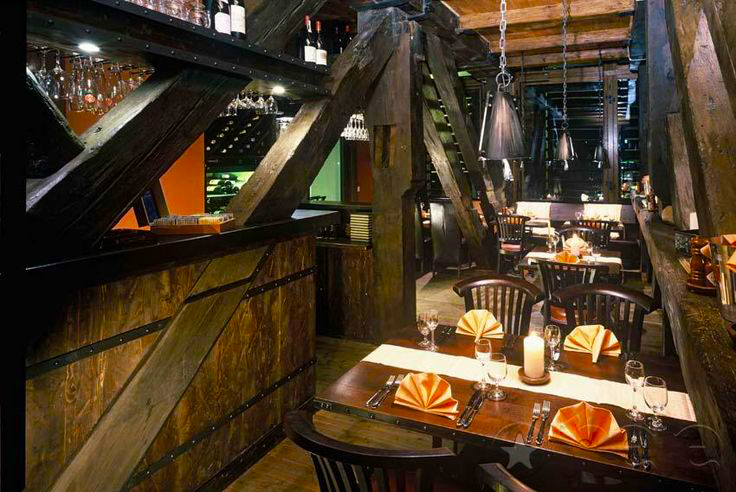 This restaurant, located in the heart of Prague, is almost unknown for many tourists. 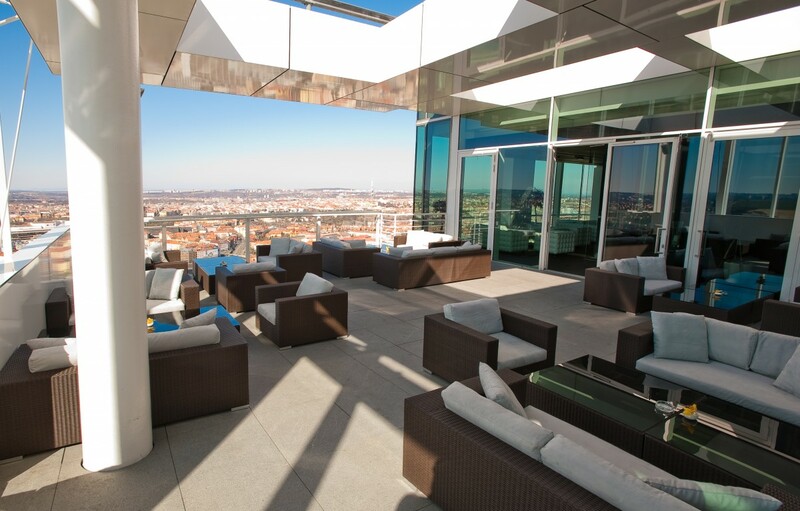 It's a shame, because if weather is good, it offers one of the most spectaculars views of the city from the terrace. It is a little complicated to find the entrance. When you stand in front of the main entrance to the department store KOTVA, go on the left along the store and cca in the middle of the store (on the left side) you will see the elevator. 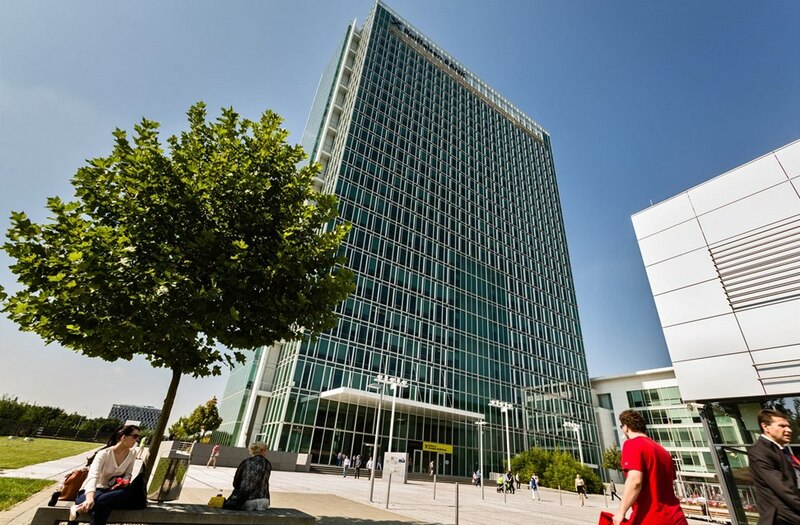 Go up to the 5th floor and you will be there :-). Prices are reasonable. 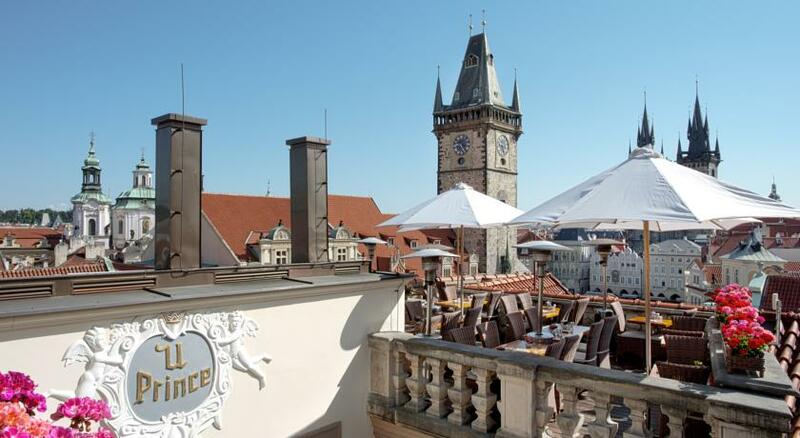 Terrace At Prince is located right in the Old Town square, accross from the Astronomical Clock, in the renovated building from the 12th century, where is also the luxurious, stylish 5* hotel At Prince. 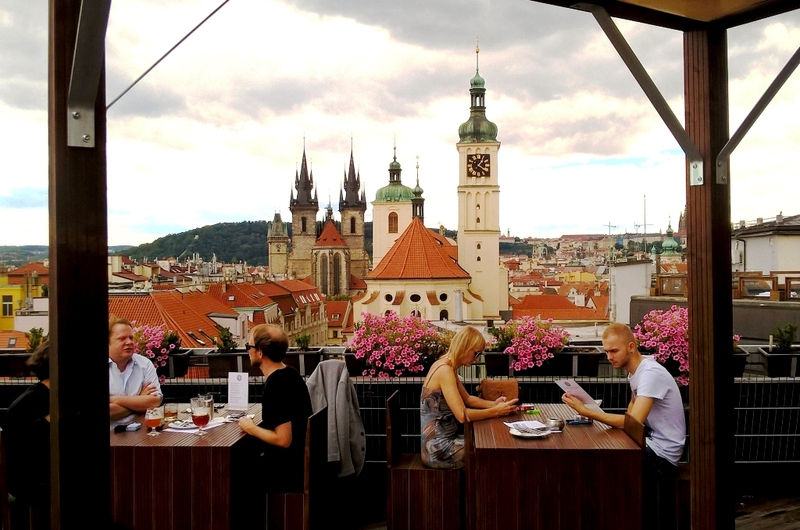 Beside the magnificent view from the roof terrace, you can enjoy excellent traditional Czech specialties as well as delicious dishes of the international cuisine. Coda restaurant is located in historic Lesser Town, in the luxurious 5* hotel Aria which is nearby the US embassy. The view from the terrace on the red roofs, Prague Castle and Cathedral of St. Vitus is impressive. 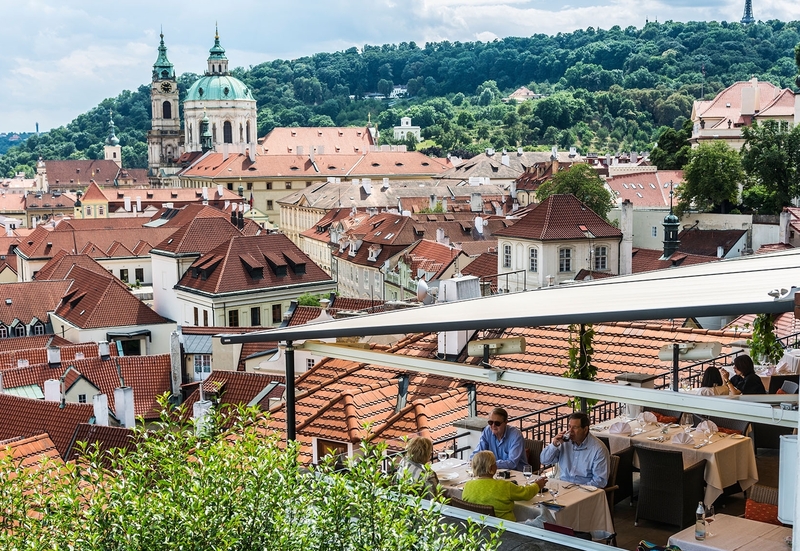 The well-known chef David Šašek prepares specialties of Czech and international cuisine. 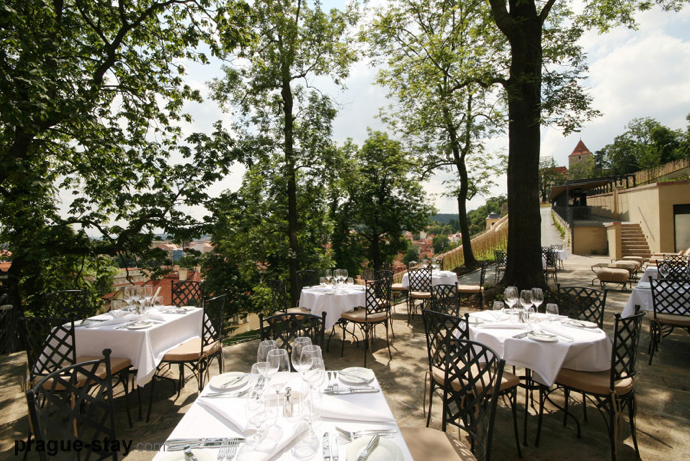 The classy restaurant Terrace At the Golden Well, located exactly under the Prague Castle, offers one of the most beautiful views of the city. The cuisine of the chef Pavel Sapík has long been among the best rated in Prague. Prices are higher but correspond with quality which you get. 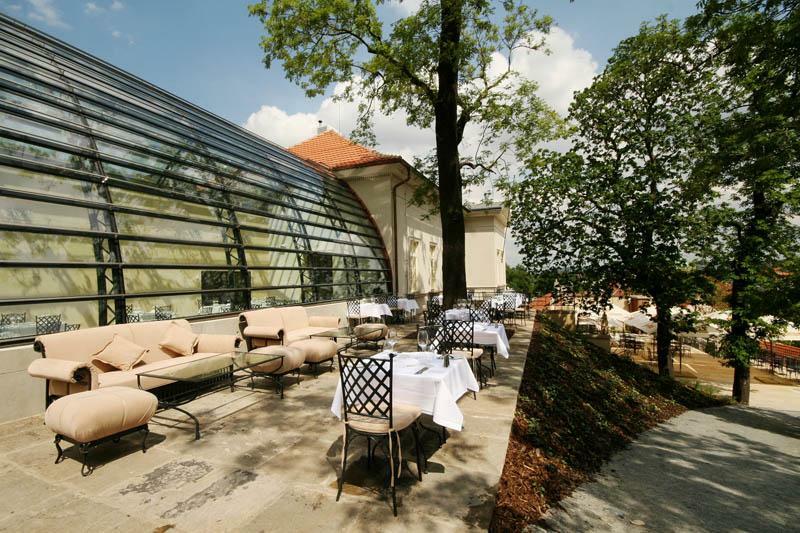 Three restaurant Villa Richter (Piano Nobile, Terre and Pergola) are located in the St. Wenceslas Vineyard complex at Prague Castle. All parts offers a unique panoramic view of the whole city. The most luxurious is Piano Nobile restaurant, which occupies the entire 1st floor of the villa and boast a big greenhouse with tropical greenery on the walls. 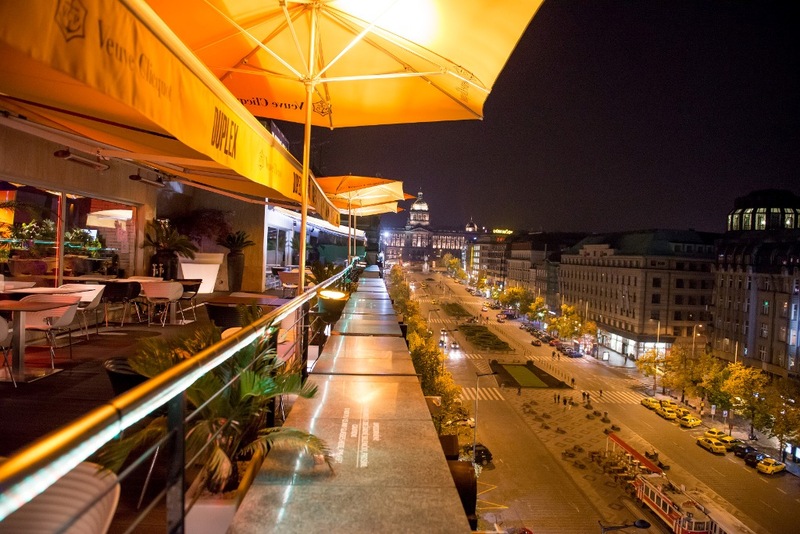 Restaurants offer modern Czech and international cuisine complemented by an extensive wine selection. 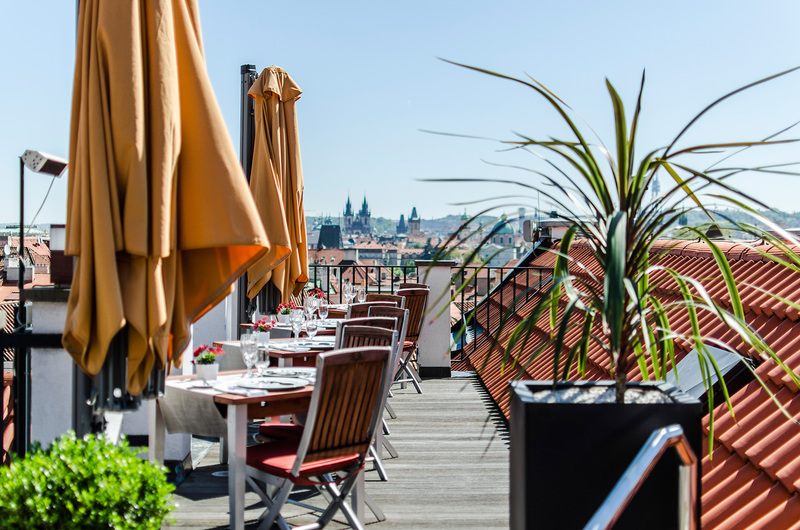 You will find the upscale restaurant Zlatá Praha at the end of the fashionable Pařížská shopping street, on the 9th floor of the InterContinental hotel. 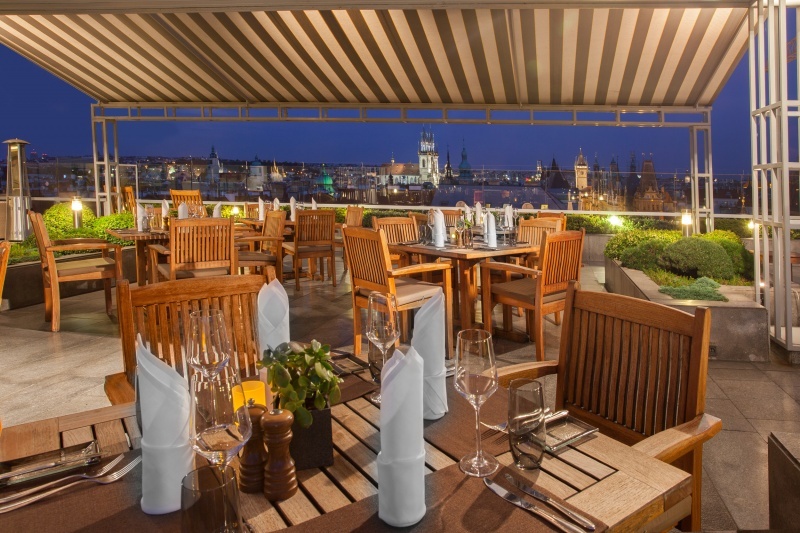 The breathtaking view from the summer terrace overlooking the Vltava River, and as well as the gourmet cuisine of the talented chef Pavel Buchwaldek, will exceed your expectation. At night the atmosphere becomes intimate with candlelight. But be ready for higher prices. 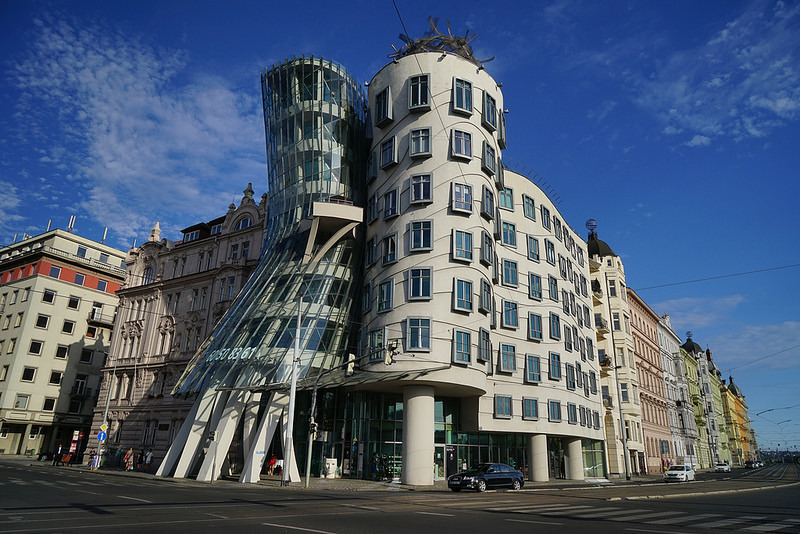 On the top two floors of the Dancing House, with a breathtaking view of Prague Castle and Lesser Town, is located a pleasant brasserie Ginger & Fred. The menu is based on French cuisine complemented by International cuisine. You can taste fresh fish, seafood and famous specialties such as veal and pork from organic farm. Here you will enjoy not only delicious food, but also the view from the panoramic terrace, where you can admire the city from 360 degrees. 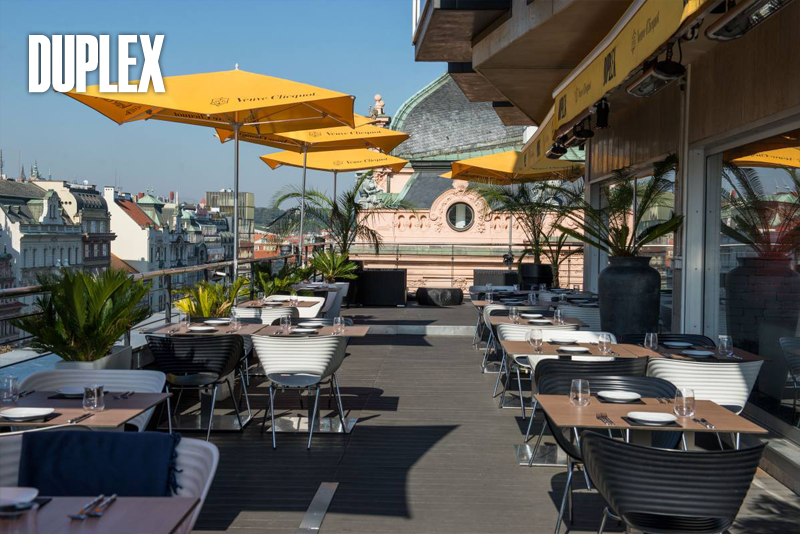 Located in the middle of Wenceslas square, Duplex Restaurant & Club with appealing, huge rooftop terrace is a gem in amongst the tourist attractions of Prague. The restaurant is open all day, and thanks to the unique position, terrific view and excellent cuisine is a great place for lunch or dinner. Starting 10pm the Duplex transforms into a music club, with lounge style seating, cool lighting and some of the city's best DJs. 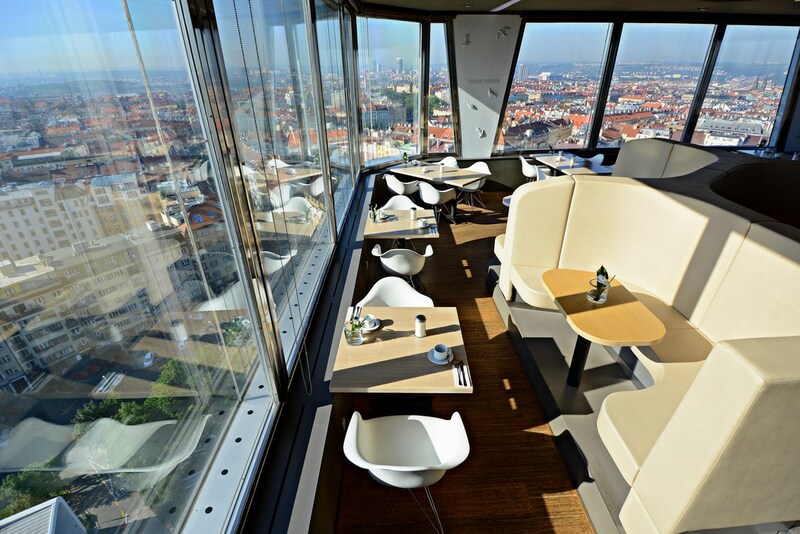 Restaurant Oblaca is located in the Žižkov TV tower and offers a special view of Prague from a height of 66 meters. Stylish restaurant is opened daily from 8 am and offers a high quality of modern international cuisine specialties. 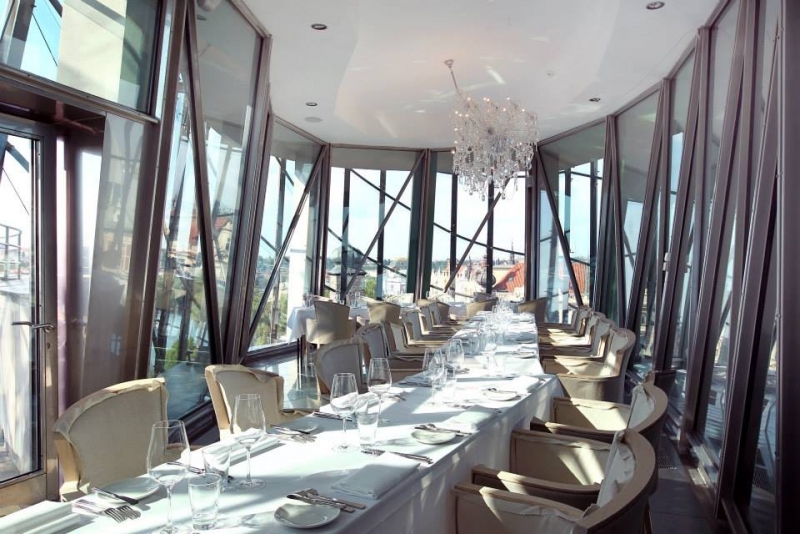 Your lunch or dinner is great to combine with a visit of the Observatory, which is located in upper floor at a height of 93 metres. 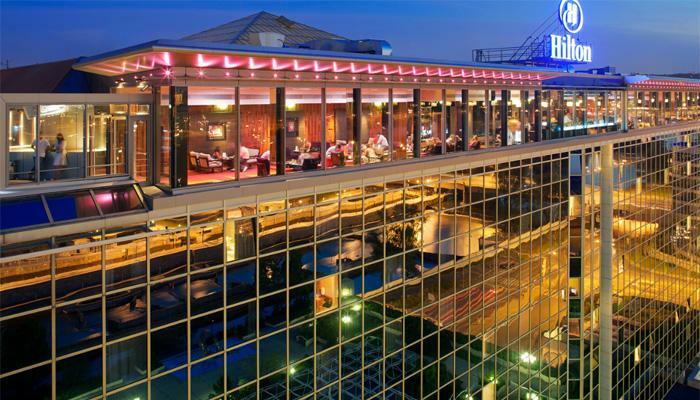 Located on the roof of the Hilton Prague hotel, Cloud 9 Sky Bar offers beautiful view of the city as a spacious glassed bar and the open terraces, which are in summer cookout. Bar is leaded by the well-known bartender Roman Uhlíř who will prepare for you a unique world drinks and even their own signature cocktails. On the 7-9th floors of Jindřišská (Henry´s) Gothic stone tower from 15th century, right in the belfry, is situated a classy restaurant Zvonice offering a gourmet traditional cuisine. The interior captivates by medieval wood beams, the huge original bell and also by a unique view into Jindrišská street from the large windows. A view of the city skyline is on the last 10th floor. Jindřišská Tower boast by a carillon with 10 bells, designed for indoor listening. Every day, it is played one of more than 1,100 melodies. Not only for businessmen and hotel guests is intended a spacious terrace of Tower Lounge Bar in NH Hotel (formerly Mövenpick hotel) located on the Smíchov hill. 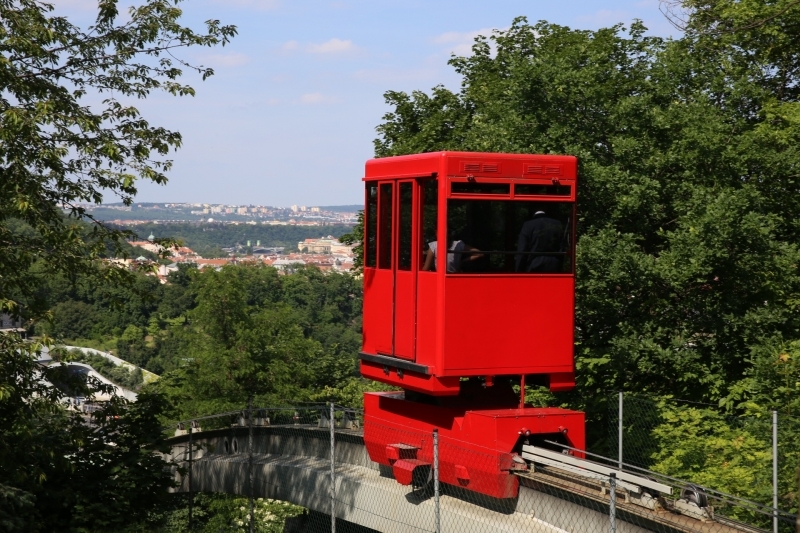 The bar is placed on the 4th floor of the upper building (the hotel consists from lower and upper building) and is comfortably accessible by a unique hotel´s cable car. Only the way up is an experience! 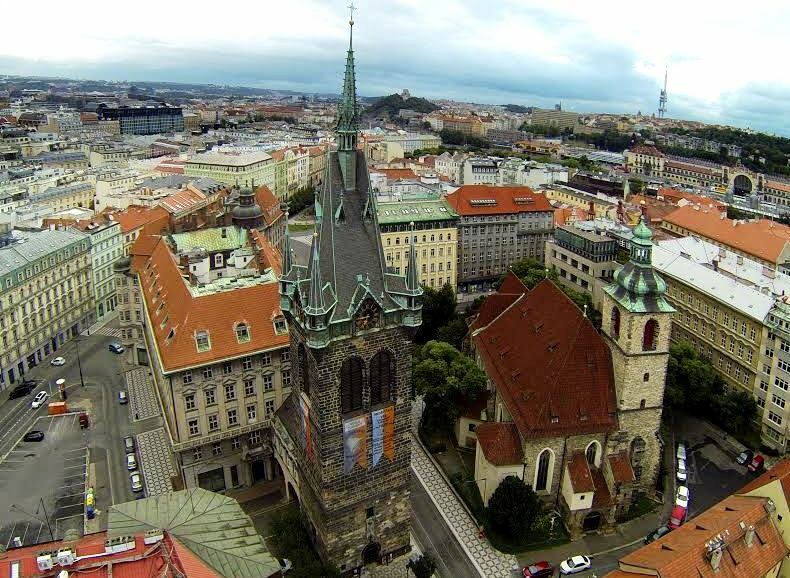 During a short journey, which takes about 6 minutes, you can admire the beauty of Prague. 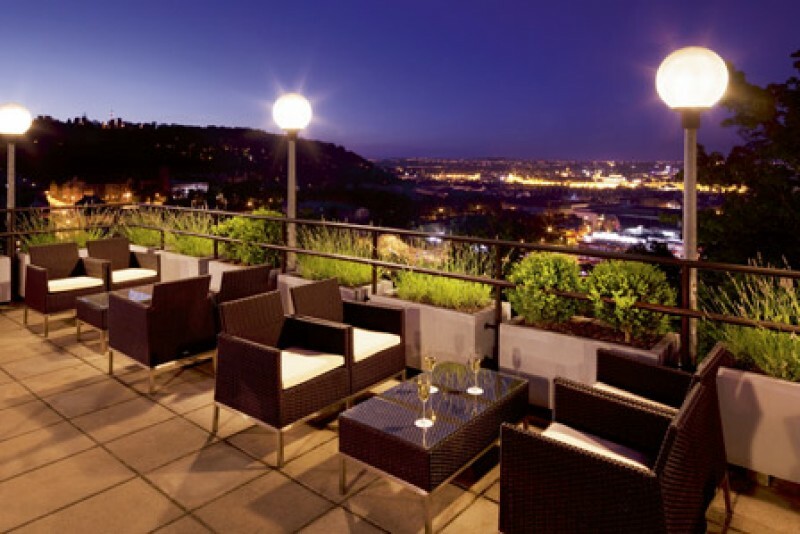 In colder months the terrace is closed but you can sit in the glass bar and restaurant inside. The restaurant offers delicious Italian cuisine. 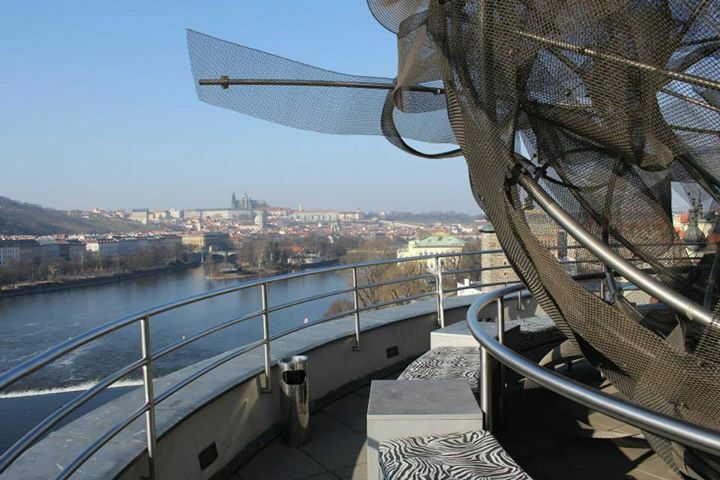 Restaurant Aureole is a unique project on the 27th floor of the tallest building in the Prague City Tower. 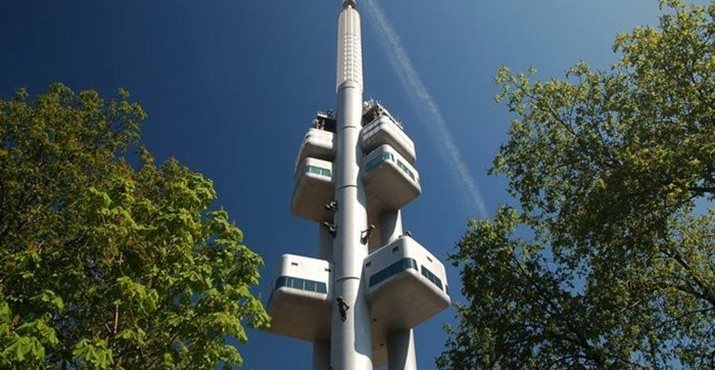 The restaurant is located in the dizzying height of 109 metres and is among the uppermost restaurants in Bohemia. The elegant interior and culinary Asian and International menu in the style of Fusion Cuisine is appealing.